Billions of pounds of fresh produce are wasted in the United States every year, and wind up going to landfills – producing harmful greenhouse gases. Meanwhile, millions of Americans are food insecure, without access to healthy, affordable meals. Forbes 30 Under 30 Social Entrepreneur, Evan Lutz, is committing his life’s work to ending food waste and hunger in America. 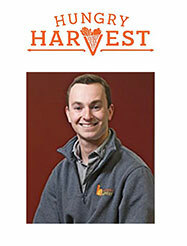 Evan is a 25-year-old social entrepreneur from Baltimore, Maryland who is passionate about food justice. He’s a frequent guest on NPR and The Washington Post. He was featured on ABC’s Shark Tank, where he made a deal with Robert Herjavec, and launched his present enterprise, Hungry Harvest. 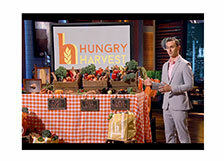 Hungry Harvest is a produce delivery service on a mission to fight food waste and hunger. They purchase surplus produce from farms, assemble it into custom variety boxes, and deliver to their customers for 20% less than retail. 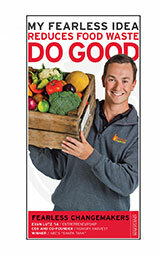 For every box they sell, Hungry Harvest helps someone in need eat healthy through either a donation or a subsidy. Evan attended the University of Maryland, where both his parents, aunts, uncles, cousins, and grandma attended as well. He studied business and helped start several clubs, including Net Impact. For a senior year class project, he partnered with a local farmer to sell his off-grade product to college students. He set up a farm stand in the basement of a dorm, selling 5 pounds for 5 dollars. Shortly after he started, the stand had over 500 customers per week, with often a line stretching out the door. This project was the foundation for Hungry Harvest, which he started in May 2014. Evan envisions a world where food waste and hunger are eradicated and do not affect a significant portion of the population. He believes we should not use land the size of California and Texas combined to grow food that nobody eats. He also believes consumers have been brainwashed on what produce is supposed to look like, causing an increase in consumer standards and subsequently an increase in waste. Evan thinks that business is the most powerful tool on Earth to create social change, and he’s committed to proving a business model that sustains profit, growth, and impact at scale. Evan is prepared to combat the massive food distribution problem that is plaguing this country, one ugly apple at a time.